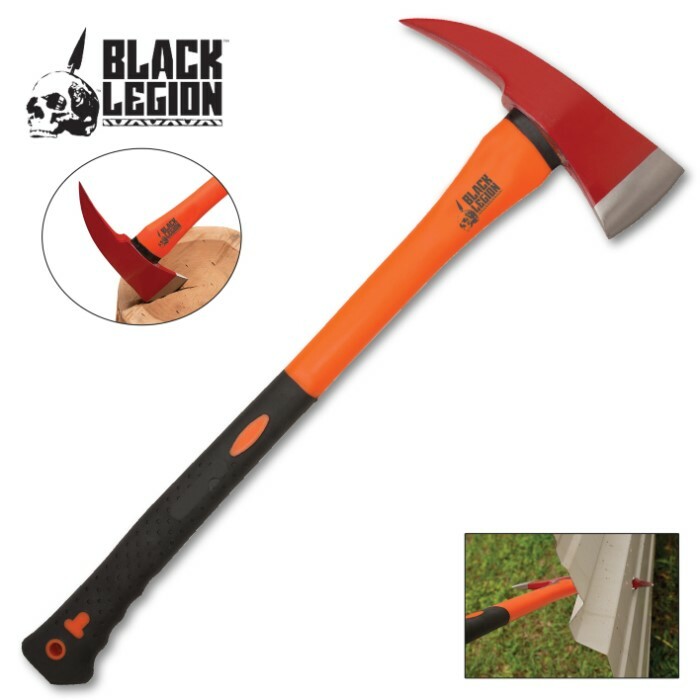 Black Legion Firefighter Axe | BUDK.com - Knives & Swords At The Lowest Prices! 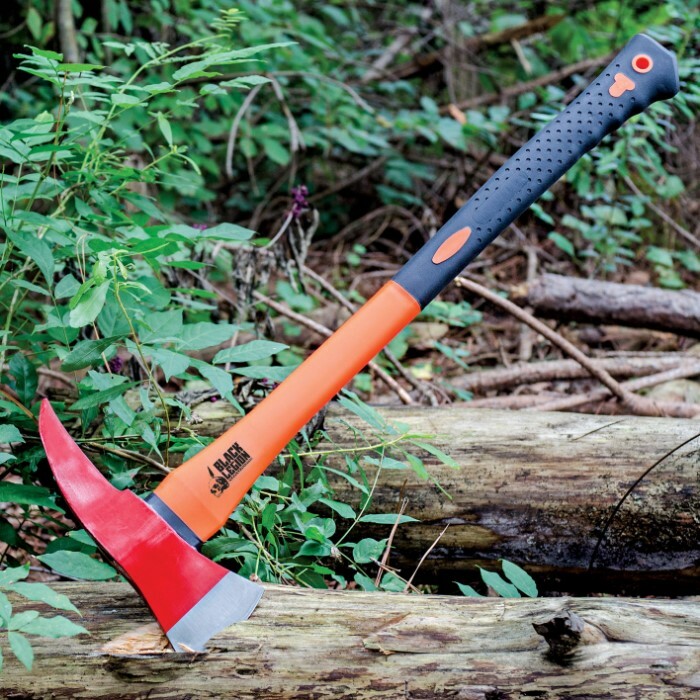 This Black Legion firefighter axe is built for tough use. It will get virtually any job done regardless of how intense it is. Great buy! Am getting another for my Dad. Can't beat for the price. Shipped quick. You get exactly what they advertised. I bought it to keep in the house but I would use it at the firehouse any day. I really like it. I'm going to purchase another as a gift! I purchased this axe awhile back. The first time I had to use it it came through with flying colors. A large tree was blocking our path to a research location in WV. In less than 10 minutes it was no longer blocking our path ! A very durable piece of equipment. Thanks again BUDK !!! WOW is all there is to say, Way too cheap. Should be priced at $49.99 but was SO happy to get for the $19.99. I owned an Estwing much like this with a hammer side, bent the blade face chopping oak. NOT going to happen with this axe, too well made PERIOD! ORANGUTANS!!! ATTENTION!! 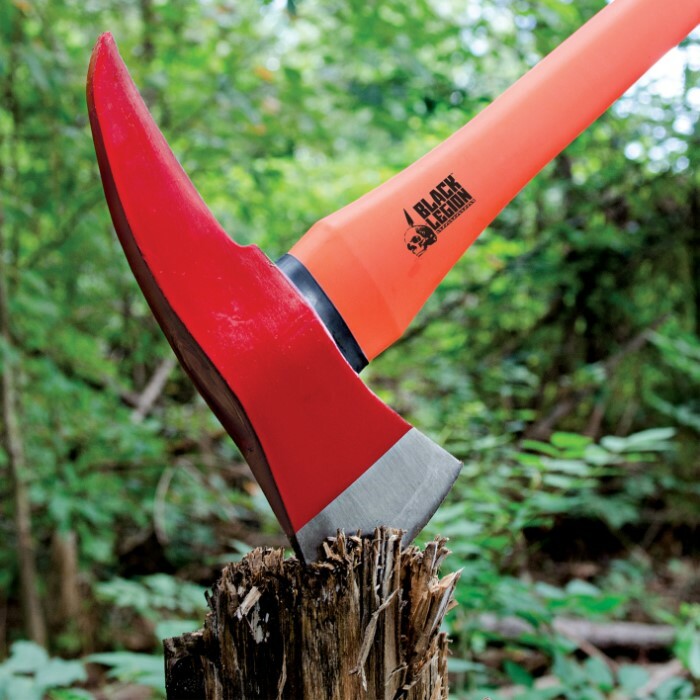 THIS AXE IS TOUGH, HAS A FIBERGLASS HANDLE AND A PICK OPPOSITE THE AXE BLADE. YOU, GUYS, COULD TEAR-UP MOST ANYTHING WITH IT; CHASE ZOMBIES, DESTROY WHOLE FORESTS, DEMOLISH ENTIRE BUILDINGS, MAYBE EVEN BRICK STRUCTURES. ME, I USE IT TO SPLIT KINDLING. IT'S HEFTY, STRONG AND JUST FEELS GOOD IN THE HAND. BESIDES ALL THAT, IT'S PRETTY. Great for the price wish it was black tho. I've been using this axe for about a week with no troubles. This is one tough axe. WOW! I bought these on a BOGO deal. They meet our needs as a survival axe in the car trunks. I highly recommend this item. Thanks again BudK.